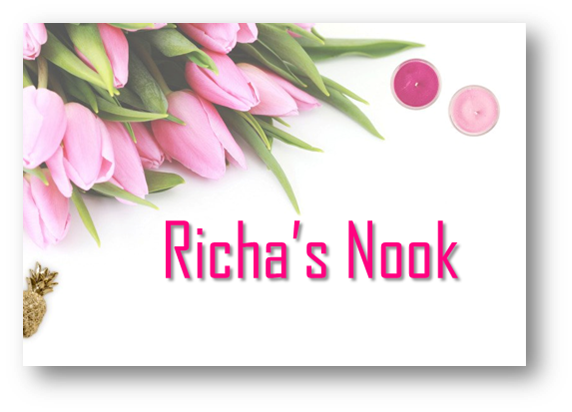 Purple – the color of royalty! I love it in all its hues – violet, lilac, lavender, plum…even the names are delicious. And in 2014, the big names of color – Pantone and Sherwin Williams – are giving it its due. That’s right! The color of the year has been named. Followers of Pantone color styles, we present to you…Radiant Orchid. And radiant it is. The color would look gorgeous as an accent wall in a teenage girl’s room, for sure. For some reason, I find this a more girly shade. It’s a rather happy, giggly kind of shade, if you get my drift. Maybe, that’s because it has more pink than blue in it. 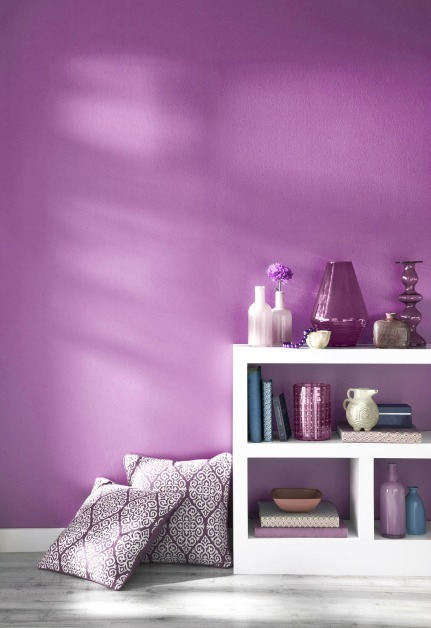 I like it paired with Amaranth, Hunter Green or Timber Wolf – kind of anchors the bouncy, bubbly Radiant Orchid. Guys, I think you will find the Sherwin Williams color of the month, Exclusive Plum, more to your liking. It has a muted elegance, a sort of stubborn this-is-who-I-am-take-it-or-leave-it style. Am I making sense? Anyway, this color has more bluish grey than any hint of purple in it and that is why it seems more manly to me, perhaps. Maybe I am over thinking the colors, but hey, isn’t that what those guys over at the Paint Industry do too? Both these colors are more accent wall colors rather than entire room colors. One is too bright and the other too muted to warrant painting kids rooms those colors. There is more than one way to bring in the trendy bedroom color schemes off the wall but still keep them in your room. We created a simple inspiration board to, well...inspire you! Comforter Set - the easiest way to bring in a color trend is through the comforter set. This Katelyn Printed Comforter Set in Purple sets the tone for the rest of the room. Wall Art - I love abstracts and this profusion and mix of colors is soothing yet exciting. Aptly named Cosmic, it has a kind of other-worldly charm. Decorative Pillow - I added this beautiful Mala Orchid pillow so you can throw it on the glider or the recliner in the room and carry the kids room colors from the bedding to the other side of the room. 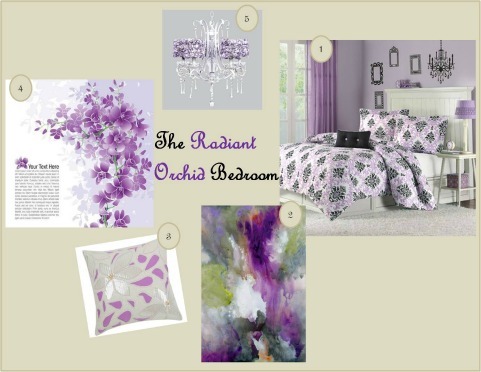 Wall Decals - How can I complete an inspiration board without adding this perfectly blossoming Purple Orchids Peel and Stick decal? Chandelier - the pinnacle of your newly decorated bedroom in the popular color trend of 2014, this Colleen 5 Light Drum Chandelier is the icing on the cake. 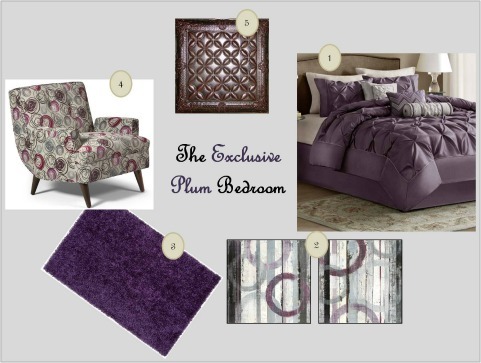 The Exclusive Plum offers its own kind of inspiration. Comforter Set - once again we set the mood of the bedroom color schemes with this Laurel 7 piece Comforter Set in Plum. It's luxurious look speaks of elegance. Wall Art - If the kids room colors are neutral, carry the color through the wall art. I like the muted tones of these paintings, but one would not be as eye catching as two - Plum Zephyr I and Plum Zephyr II are pictured here. The Rug - From the walls to the floor, the color trend flows on with this Nitro Dark Plum rug. Doesn't it make you want to wiggle your toes? Recliner Chair - A teenager's room needs extra seating and this stunning Muir Norelle Chair is one luxury point this ultra-chic room calls for. Faux Leather Wall Panels - Here's something different. A teenage boy's room will get extra brownie points if it has these Merlot Faux Leather Tiles. You can put them on the ceilings or use them as wall panels. The rich, dark color gives the room a cozy feel. What do you think about the new color trend of 2014? Do you see them as becoming popular kids room colors? Or do you tend towards using these colors on accessories in the room?